Schach DVD The Triangle Setup - A complete defense against 1.d4 | Videolektionen | Eröffnung | Training | ChessBase | Schachversand Huber - Spielen Sie eine Partie Schach ! 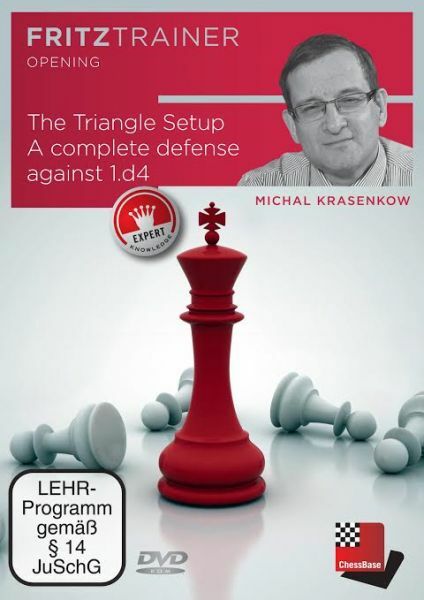 Produktinformationen "Schach DVD The Triangle Setup - A complete defense against 1.d4"
The Semi-Slav defense (1.d4 d5 followed by ...e7-e6 and ...c7-c6) is one of the most popular opening set-ups for Black. Black can follow two entirely different concepts. One includes an early ...Ng8-f6 and leads to a number of popular and deeply analysed systems: the Meran, the Anti-Meran, the Botvinnik, the Moscow, the Anti-Moscow, the Westphalian, etc. The other, in which Black refrains from ...Ng8-f6 at an early stage, is presented by GM Michal Krasenkow on this DVD. Black keeps a choice between two double-edged interesting systems: the Noteboom variation (1.d4 d5 2.c4 e6 3.Nc3 c6 4.Nf3 dxc4) and the Stonewall (...f7-f5) if White plays an early e2-e3. Of course Black’s decision to refrain from an early ...Ng8-f6 gives White other options, the most important being the Slav gambit (1.d4 d5 2.c4 e6 3.Nc3 c6 4.e4 etc.). Therefore Black’s set-up may lead to a whole range of different and interesting positions, which help the black player to broaden his strategic and tactical understanding. This makes the Noteboom/Stonewall opening repertoire a particularly good choice for young, aspiring players. Michal Krasenkow born 1963, is one of the ChessBase authors with the highest ratings. In the 1997 FIDE-WCh he reached the quarter finals and in 2001 he even pushed his rating above the 2700 mark. Krasenkow, born in Moscow, has lived in Poland since 1992 and is a Polish citizen. Kundenbewertungen für "Schach DVD The Triangle Setup - A complete defense against 1.d4"